Today, please welcome contributing designer Kirsty Smith, with her delicate and handmade take on a Valentine of a scrapbook page. Thank you, Kirsty! As Valentine’s Day approaches, it’s nice to be able to scrapbook about the people in our lives that we love. But while pages about loved ones are topical at this time of year, and there’s lots of great inspiration around, we don’t have to document these feelings with giant pink hearts. So today, I’m going to share with you a page that is personal and heartfelt, but takes a look at the theme of love from a different design perspective. Don’t get me wrong: I love pink as much as the next person and I use a heart icon on almost all my pages as a heart is a universal way to indicate that you like something, or someone. But it’s nice to mix things up sometimes. I wanted to make a page about my relationship with my partner, documenting some of the letters I’ve written to him over the last few years. I loved the idea of recording the things that I have written so that I can look back on them at some point. I used a photo as the starting point for this page, and drew the colours of blue, grey, yellow and teal from the picture. I wanted the page to have a soft, romantic feel with plenty of space, but to still have plenty of detail. To me, this means a clean, white background, and lots of detail in layers. I pulled my supplies together and found I had three key elements to the page. First the picture, which influenced the colour choices. Next came the journaling. I wrote my journaling out onto little sheets of writing paper and folded them to fit into a vellum envelope. I find vellum to be a wonderful material for journaling like this: it’s just dusky enough to hide the details of more private words from casual eyes, but it’s transparent enough to let my handwriting show through. I always aim to include my handwriting on my pages in one way or another; our handwriting is something that is unique to each and every one of us, and it’s a nice way to add your own twist to a design. I also created a title that would reflect the letter-writing idea of the page. I wrote out my phrase on scrap paper in a thick, black marker pen, making sure all the words were touching and adding a heart here and there both to tie in with the design and link the phrase together more securely. I cut out the phrase to make a template, and then traced around it onto cardstock. To complete the title, I cut out the cardstock title with a craft knife. I’ve used this technique a lot lately, and if you use a die cutting machine, it’s probably much quicker and you will achieve the same effect. But I enjoy the process, and I have been loving the lacy, delicate look titles like this produce. My only concern with the title was that it wouldn’t stand out or be legible, so I outlined it in black pen for emphasis, and stacked the title on coordinating scraps of patterned paper. The layers add detail without being overwhelming, and raising the title up on foam squares makes it a real feature of the page. With the three parts of my page ready – photo, journaling and title – I was ready to put my design together. The three elements together nicely filled three points of a 2×2 grid design. Grids are wonderful starting points for scrapbook pages, but I didn’t want anything too rigid or blocky in style which might clash with the softer feel of this page. So I opted to create a background design on the white cardstock to give the illusion of the fourth square in the grid, and to add additional layers of texture to the page. To create a background design, I sketched out a few slightly wonky heart shapes, and cut them out with scissors (although punches or die cuts would work equally well!). I arranged them on the page and in pencil, filled in the middle with a few words drawn from my journaling. The grey of the pencil tied in nicely with colour scheme and meant the contrast with the background was less severe than the black journalling pen. Then I adhered my hearts to the page with a trusty clear glue, and the background was complete! Making a background like this is a great way to add detail to a page. It adds layers and texture through the use of text, but because the design is white on white, it won’t draw attention away from the main focus of the page. This page is a layout of contrasts. It’s a Valentine’s day page without pink; it’s a simple grid design with lots of detailed letters; it has hidden journaling in plain sight and there are four square blocks with only three of them filled. For me, it works and this is a page I hope I can keep adding too, tucking future letters and sentiments away into the envelope to look back on one day. Of course we’d love to see what you create inspired by Kirsty’s techniques! But which will you pick? Are you going to try the hand lettering or maybe writing in a tiny heart frame? Or the white on white colour scheme? Decisions, decisions! Alice is here today with a little project for your weekend! Enjoy! I love going through all my photos. Time and time again I do it and it never gets boring. Every time I look at a photo, I get the same feeling I did the first time I saw it! With all this ‘lovely dovey’ talk in Valentine’s week, plus some behind the scenes work on an upcoming article that’s a little bit ‘Scrapping your Significant Other’, I felt this project would be best shared with that in mind. The photo I’ve used for this was taken at Christmas last year, when I went ice skating with the boyfriend’s family at Somerset House. Now I have to say, ice skating is not my most favourite thing to do, however it didn’t take away the magical atmosphere! This is one of my favourite photos of him and me as it very much was a memorable day (unfortunately due to the fact I nearly cried the whole way round the rink). For this you shall need: one photo, felt in a colour of your choice, ribbon, embellishments you wish to add, sewing utensils and standard supplies e.g. scissors. Oh, and a heart stencil! If not you can easily make one in a word document. I found mine on Pinterest. When choosing your heart, remember to keep in mind the size of your photo. My photo is wallet size, so I chose a heart template a bit bigger than that. 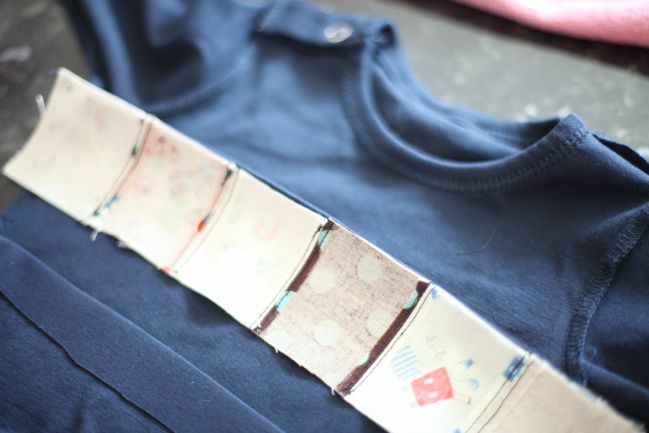 Once you’ve found the template you wish to use, print it, pin onto your fabric and draw around. I drew around mine with a little bit of room, in case I needed to trim off any bits, however that choice is yours! You’ll need to cut two hearts from the felt. When you’ve finished cutting out your two hearts, you will need to cut out a smaller heart of one your pieces. If you don’t wish to do this freehand, either print out a smaller version of your heart or find a stencil with the heart already inside, just like mine. Nevertheless, if you’re feeling brave, go ahead and draw a heart freehand! It will work whatever technique you use! Pin down the two hearts, and cut your photo to size. For the photo, I printed it out wallet size. Obviously the bigger the photo, the bigger the heart will need to be, so always keep that in mind! Remove your photo at this stage and pin your hearts together. Making sure the full heart is at the bottom and the open heart on top. When you’re pinning, place your pins closer to the inner edge. This will give you more room to work with when it comes to sewing. At this stage, get your ribbon, fold in half and tuck the edges at the top of your heart. Pin it down! Annoyingly, I forgot to take a photo of this stage, so do forgive me! Place under your sewing machine! You want the tension to roughly be on about 1.5 or 2, most likely, though your machine may vary. 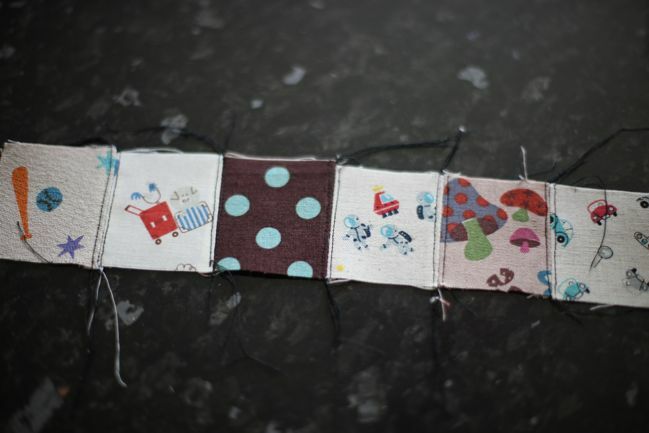 It’s completely up to you what stitch you wish to use, whether it be tiny and straight like mine or zig-zag! Once you’ve tidied up everything, you should be left with a cute heart photo frame! It’s such a quick, simple project- you could make many and use them for gift wrapping or a banner. If you’re up for a challenge, why not make a heart photo frame chain? Continue sewing hearts and attach them together via the ribbon, making such a cute gift for someone or wall feature. Dress it up by securing the hearts to each other with buttons or bows. Of course, if red love hearts aren’t your thing, the entire idea is easily switched to any motif you care to cut from felt! It could even work with a lettered banner – place your photos in the centres of letters that have a window (A, B, D, O, and so on) and spell out a name or phrase adding in the rest of the letters as just cut from felt or fabric. How would you customise this project? Happy Belated Valentine’s to all you wonderful readers and happy sewing! And a P.S. If my boyfriend reads this – Happy fourth Valentine’s to us and hopefully many more! Alices Homemade Studio and you can follow her on pinterest. Oh, how I love it when inspiration comes along at just the right time. That beautiful scrapbook page tutorial by Kirsty Smith went live at just the same time when the Dear Lizzy 5th & Frolic stamps were sitting on my desk. I’d been using the word stamps in that set a lot more than the image stamps in this set, so Kirsty’s page quickly reminded me how easy it would be to make something lovely with the Polaroid-style frame. I put it together with a sheet of kraft cardstock and scraps from my February Best of Both Worlds kit. …three times on each of three patterned papers, for a total of nine frames. Then cut out all those frames with scissors. Easy enough. Spend twenty minutes moving the patterns around in a grid until finally settling on this arrangement. Then spend the next twenty minutes wondering why that took twenty minutes to decide. This is a slippery slope. 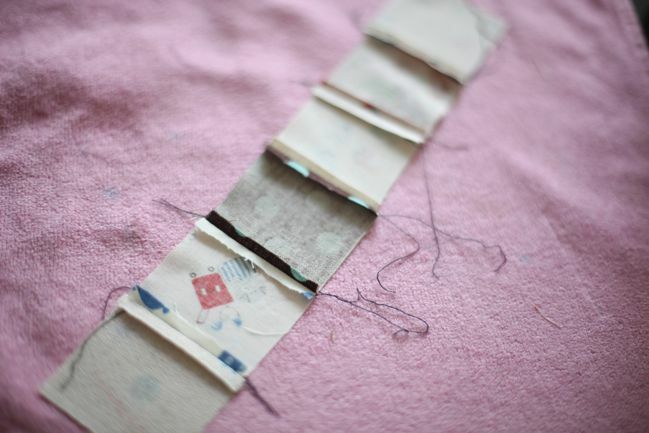 Transfer the frames – in that much pondered order – to a sheet of neutral patterned paper. Kirsty’s pages often remind me to use all that grid paper in stash. Attach with adhesive that allows for things to be moved about – or just be way more graceful than I am and not knock the frames onto the floor six times while you’re trying to figure out the rest of the design. Your choice. Cut the grid paper to frame the frames, ink the edges, and attach it to the centre of the kraft cardstock background. Exhale happily that this step had significantly fewer opportunities to derail for another twenty minutes. Use the spray tube and an eye dropper to splatter mist on two corners of the page to form a diagonal line. I used gold lame color shine spray by Heidi Swapp and Studio Calico Mister Huey’s spray in Dark Calico (that one is on sale at the moment if you’re looking for a dark neutral shade, by the way). Be completely impatient and refuse to wait for the larger droplets to dry, and enjoy the feeling of living dangerously throughout the rest of the creative process as a result. Use the scraps from cutting out the centre of the stamped frames to cut three photographs to a size that will sit nicely behind three frames. I picked photos that had some nice details that were otherwise lost in a larger image when printed at 4×6. Realise it might be simplest to make all the red frames match, all the green frames match, and all the turquoise frame match. Spend another twenty minutes deciding which colour would be best for the photographs. Eventually choose turquoise. Live the rest of my entire life wondering if this was the right decision. Start the green frames with a stripe of tape inside the window. …and a smaller punched circle over the top. Feel like I just won house points for Hufflepuff by managing to get all three patterned paper colours into this embellishment grouping. 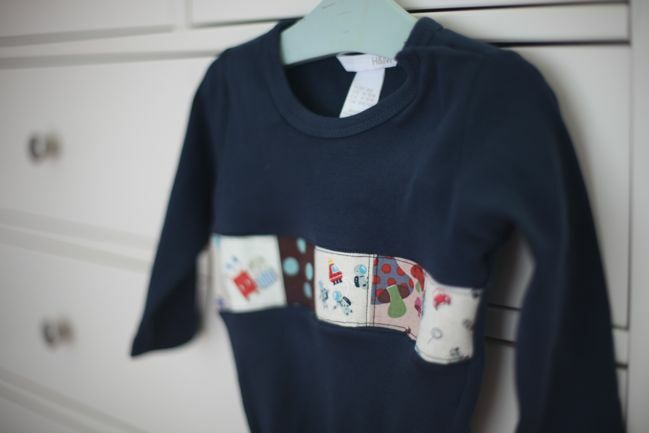 Top with a postage stamp sticker from Jenni Bowlin Studio. Add dimension with a wood veneer file tab by Studio Calico. Realise the red frames are now looking very naked by comparison. On the two corner frames, add a punched circle and a Studio Calico badge embellishment. Ten points to Hufflepuff for the group of three formed by the circle shapes in the punched piece, the badge, and the closest large droplet of ink, all overlapped. Title gets the centre square. The white woodgrain Thickers and the red Jenni Bowlin letters are both from the kit, plus those tiny turquoise letter stickers are an older set in my stash by Cosmo Cricket. Congratulate self that ‘Kwai’ fits so perfectly in the frame, since I didn’t think to check that before this step. Use the arrow stamp in brown ink on top of the wood veneer tabs, mostly because I’ve fallen in love with the look of stamped veneer. Point the arrows toward the nearest photo to help direct the eye to the photos, which is extra helpful with the combination of small photos and plenty of embellishment. Add some leaf stamps to the corners of the two red frames. And some little red star stickers too. Then I noticed the turquoise frames started to feel too plain, so I added red baker’s twine to the edges. Award ten points to whatever house baker’s twine belongs to for its amazing ability to be a perfect little detail on pretty much anything. …and also has a few labels with phrases that will fit this page. Then finish with writing around the grid paper, and make a serious note to self that Kirsty’s layered page idea would allow for significantly more writing than this. Award Kirsty at least fifty house points for her inspiration that lead to this new page whilst feeling a sudden urge to go through my entire basket of scrap papers and stamp them all with Polaroid frames. Decide that would take way, way too long. Oooh, I do love a little hot pink. It can brighten up the greyest of days, and once someone said something that really stuck with me: ‘I think the reason I always think you look younger is because you wear hot pink’. Ladies, someone only has to say that to you once to make you a believer, right? Hot pink it is. Also, I just really like the word ‘hoopla’ because it is fun to say and I will find any reason to throw it into a conversation. Sometimes that’s the only reason you need. Today’s bit of hoopla in hot pink includes the chance to win a prize pack of Cosmo Cricket scrapbooking supplies! And I tried to meet a challenge from SJ, who suggested I try to scrap in a 7×7 square on the 12×12 page. Find out how well I stuck to that rule! Watch the video to see this page come together. To enter the challenge, you need to create a project somehow inspired by this scrapbook page. It can be very similar or quite different, as you could use the entire layout as inspiration or you could pick just one thing – a hot pink background, using the Upcycle collection, starting with a 7×7 square, misting the background, scrapping that one photo that doesn’t go with anything else… or anything else that caught your attention! Create your page and upload it to your blog or a scrapbook page gallery like Two Peas or UKScrappers. Then leave a link to that page (not your main blog address) in the box below. One entry will be chosen to win a prize pack of Cosmo Cricket scrapbooking supplies! (Please follow Cosmo on Facebook or Twitter to help say thanks!) Entries close this Sunday (21st August 2011) at midnight UK time. As promised, a little something special to continue throughout this week, and I hope the video fans will enjoy! Each day this week, stop by to see a new video with a layout tutorial, then enter for a chance to win a prize pack of goodies from some of your favourite manufacturers. Today’s video features products by Jenni Bowlin Studio and I have a JBS prize pack to send to one lovely scrapbooker! To enter the challenge, all you have to do is create something inspired by the video. It can be very similar to the page if you like, or you can take inspiration from any element you like – the colours, the photo placement, any technique – whatever takes your fancy. Then upload your project to your blog or a page gallery like Two Peas or UKScrappers and leave a link to the post (not your blog’s main page) in the box below. Deadline is next Sunday (21st August 2011) at midnight UK time! In what has quickly become a week about charity and scrapbook sketches for some reason, here is the page I wanted to show you yesterday afternoon, but the powers of the internets decided we needed to wait until this morning because they didn’t want to go as fast as I hoped. Just in time for the weekend though – crafty time central! To create this layout, I started with the same sketch set as a challenge for the contestants and anyone playing along with the UKScrappers Scrap Factor contest. It’s this sketch I shared yesterday. You can see the contestants pages from the sketch here. I know some members prefer to vote for the page that grabs them from the small image, but I really enjoy reading the commentary written by the contestants, explaining the creative choices they made in their details. So I thought I’d share my process for making this page, from the sketch to the finished scrapbook page. Anyone is welcome to join in the Play Along with Scrap Factor challenge at any time. If you’re not already a member of UKScrappers, you can join for free. The challenges end on Sunday evenings, so you have a couple days left if you would like to participate in this round. There’s a prize each week for one paper layout, one digital page and one hybrid page. Some weeks we don’t have any hybrid entries! ‘Hybrid’ just means a mix of digital and paper scrapping, so if you print out a journaling card printable and include it on a paper page, that’s hybrid. Easy! And next week’s challenge is already posted – a layout inspired by film or television. Play Along entries for that challenge are due the following Sunday – 12th of June. And there are two posts today because the weekend giveaway goes live this evening – and goodness, it’s a good one this week! In school, the biggest sewing project I had to complete was a set of pockets designed to hold a reading book, notepad and pen on the edge of a bed by tucking a long tail of the pocket beneath the mattress. A nifty idea, perhaps, but it was ironing rectangles of fabric and sewing them together, and I can’t say I’d ever sat in bed really searching for a place to keep my reading book. 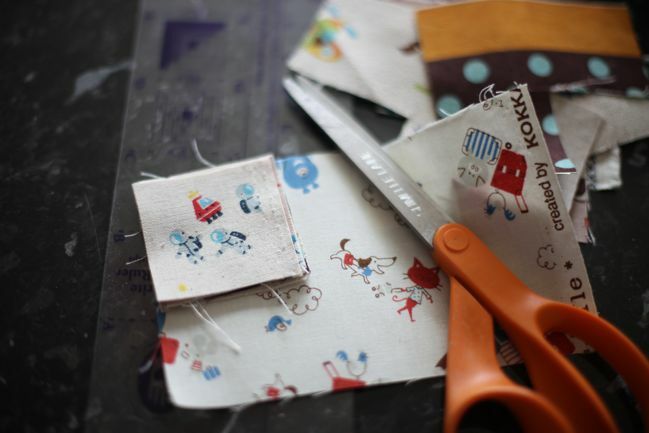 So when a reader emailed me recently to say her daughter wanted to learn to sew things for herself but was finding her school sewing lessons a bit less than inspiring, I totally understood. 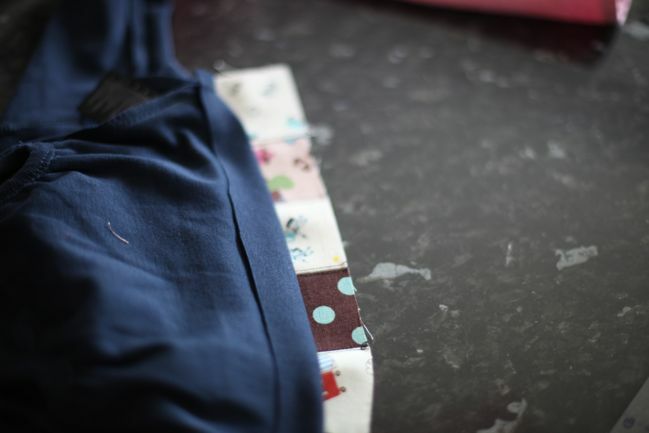 She is thirteen and just getting to grips with the sewing machine, so I thought this might be a good starting project, as turning an old t-shirt into a new skirt is super easy, and you don’t even need elastic or a zipper. 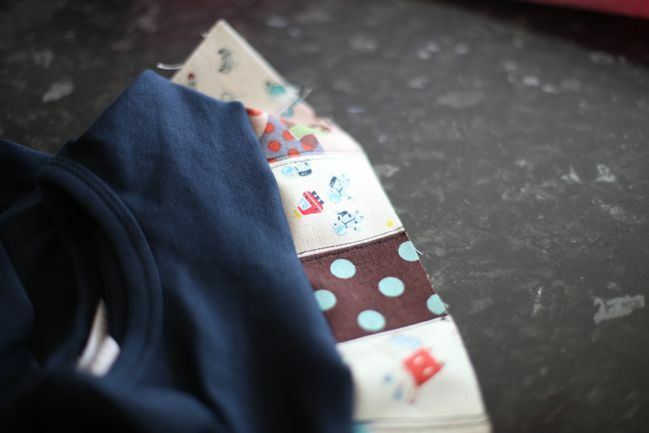 All you need is the shirt, plus scissors, thread, iron and sewing machine (or needle and patience). Plus an optional second piece of fabric for the waist of the skirt, if you prefer a contrast trim. In case it’s useful for you or someone you know, I’m posting it here too! A few Sunday reminders: There are two giveaways that close tonight: the butterfly prize pack from Jenni Bowlin and the Acrylic Photo Block from your own picture. Today is also the last day to enter to win prizes for April’s 4×6 Photo Love challenge both here and at Two Peas. And you can vote or play along with Scrap Factor over at UKScrappers. Who knew it was such a busy day in the crafty world?! And now, on to the ridiculously easy skirt! You’ll need a t-shirt to start. 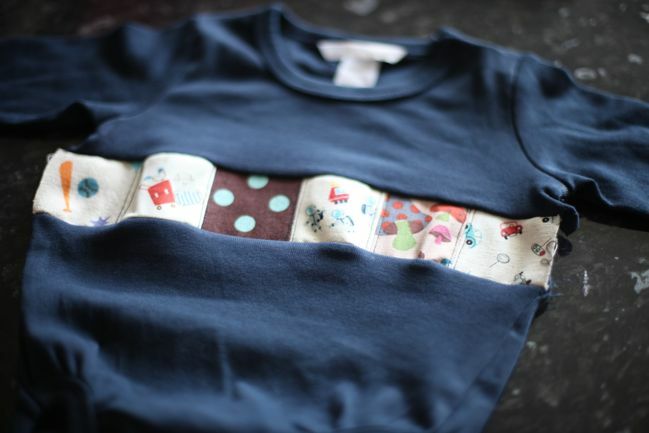 I had this shirt that has been bothering me – the very first time I wore it, tiny holes started to appear in the fabric. Clearly I fell for a bargain price that wasn’t actually a bargain. But all the holes were at the very top of the shirt, so it seemed something could be done from the rest of the fabric. Make do and mend, as it were! Start by making sure the work surface is clean (which seems obvious, but I can’t be the only person in the world you might have inked or misted on the same surface where they lay out their fabric? Oh. Maybe it is just me.) and iron the shirt to make it easier to cut and sew. 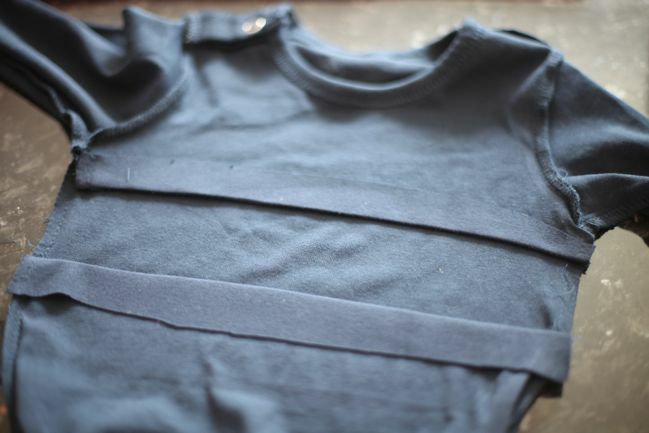 Cut straight across the shirt, right under the arms, so now you have a tube with an unfinished top edge. Go try it on. The bigger the shirt, the looser the skirt will be, of course. Unless you’re sewing this for someone quite young, you’ll probably find the top edge of the skirt is way too loose for the waist, even if it fits at the hips. Make a note of roughly how much you need to take in by pulling the fabric at the sides and marking the spot that would make it fit. Then take the skirt off, turn it inside out and sew a diagonal line on both side seams that will take it in to a good size for the waist. You don’t want to make this too tight, since you’ll need to get the skirt on and off without a zipper (we’re going to add a tie to keep it snug while it’s on). Try it on again to see if it’s a good fit. If not, rip out those stitches and sew again. When you’re happy with the fit and you’re sure these stitches are secure, go ahead and cut off the excess fabric. Next we’ll add a sash-styled waistband. 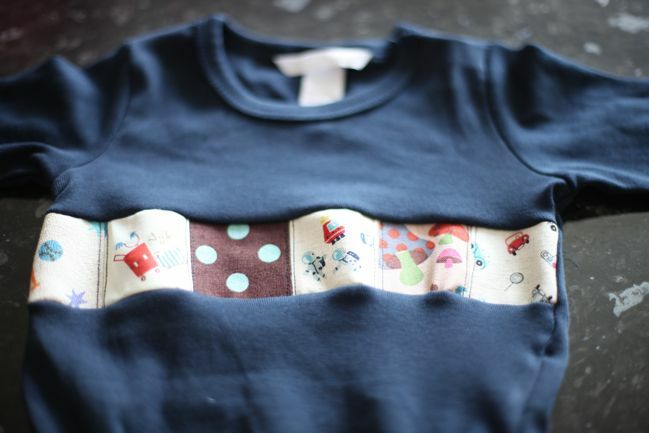 For this, you can use a piece of contrast fabric or you can use the leftover fabric from the top of the t-shirt. You need a length that will go around your waist and tie. If a measurement will help, grab some string or ribbon and find your own waist + bow measurement! You can also decide how wide to make your waistband. 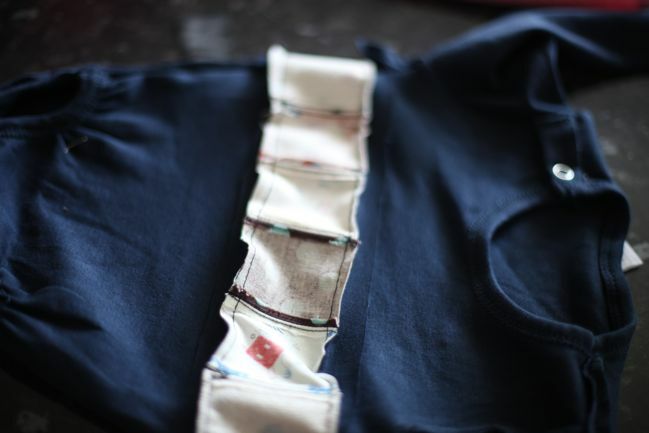 The fabric will be folded in half, so cut a strip that is twice as wide as what you want. If you use a different piece of fabric, you may be able to cut this all in one strip. 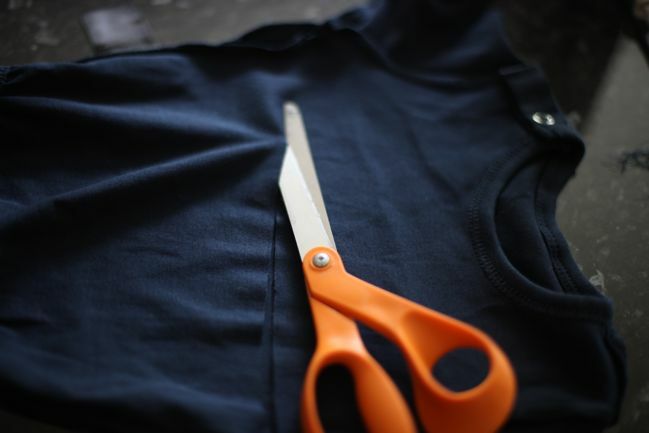 If you use the t-shirt leftovers or scraps of fabric, you’ll just need to patch and piece it together to make the length you need. Fold the strip in half, right side out, and iron in a crease. You can also hem the very ends if you would like. With the skirt and the sash right side out, find the centre of the sash and the front centre of the skirt. Pin the unfinished edges together, then pin around the edge of the skirt if you like. Jersey will curl around the unfinished edge, so either pin or go slowly while you sew to uncurl those edges. 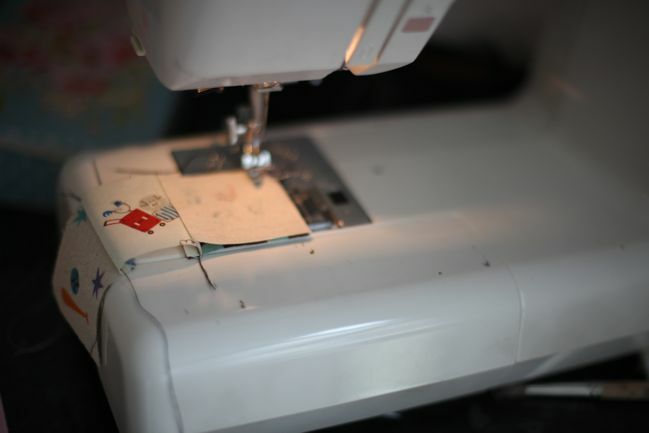 Sew all the way around with a plain running stitch on your sewing machine. You’re sewing the unfinished edges together, right sides facing – the sash is going to fold up from this seam when you’re done. Leave an inch or two unstitched at the back centre of the skirt. That will let you pull in the waist of the skirt when you tie the sash. 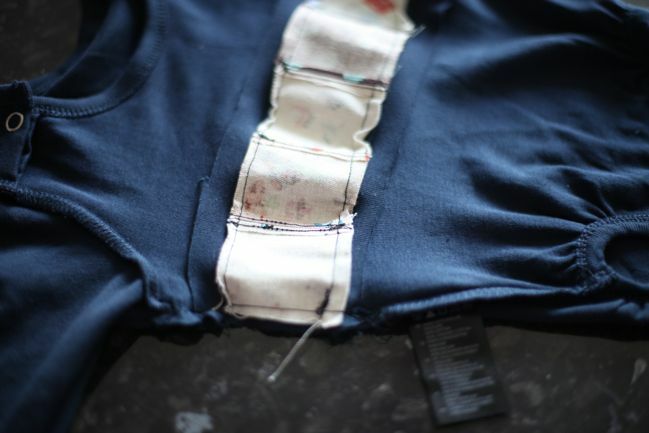 Trim any loose threads and iron the waistband so the join of the two fabrics are smooth. And that’s the basic skirt done! Of course, you can further customise it with patches, bling, embroidered butterflies… whatever your style may be. And if you have extra fabric left over from the top of your shirt? You can cut that up to create fabric flowers or an alice band or something else lovely to match your new skirt from your old t-shirt. …and I’m not sure which is better: super easy projects or projects that work for both youngsters and grown-ups! So… what have you been making this weekend? I have to admit I am really superstitious when it comes to baby presents, and making them or buying them or giving them too early just makes me extra nervous. Just one of those things. So with new nephew all arrived and fine and healthy and happy (yay! 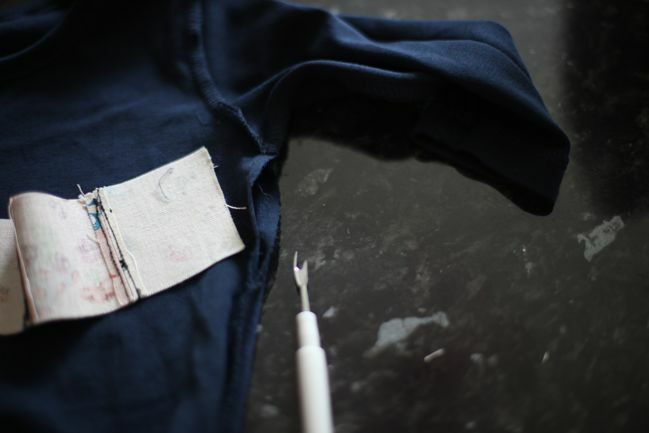 ), I decided to have a bit of a crafty afternoon with a baby theme, including this quick and easy customisation of a onesie or babygro or whatever you prefer to call such a one-piece-garment-for-infants. For the record, spellcheck likes neither onesie nor babygro. 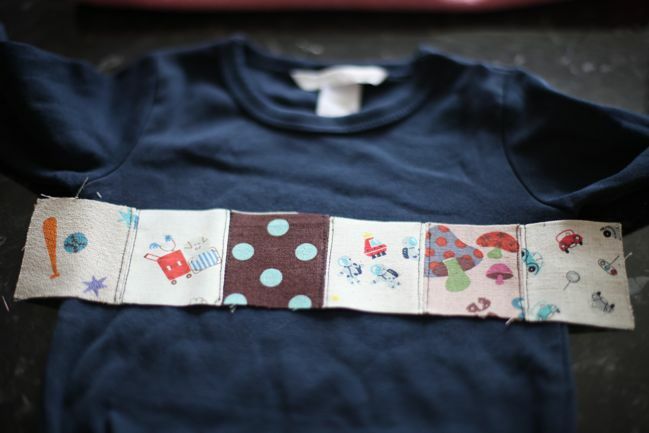 Spellcheck is much happier with t-shirt, and should you like this idea but not have an infant available as your crafting muse, you can use the same steps to alter a t-shirt for yourself. So I figured I’d share a little how-to for this easy sewing project. 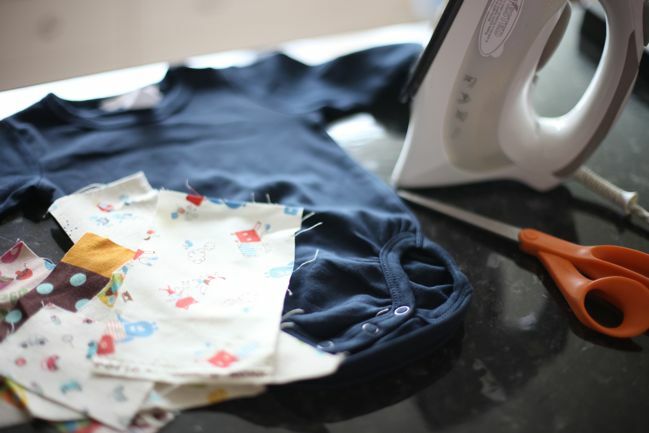 You will need the item you want to customise (onesie/babygro, t-shirt, etc), a handful of fabric scraps (soft fabrics are good), scissors and an iron. 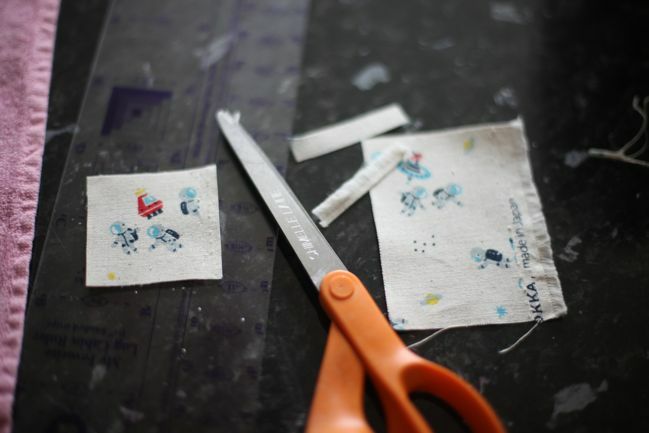 You’ll also need a sewing machine and thread, and a seam ripper and ruler may be helpful. If your fabrics are creased, be sure to iron everything before you start. …then use it as a template to cut all the other pieces. Line up the blocks in the order you like, and make sure this strip is wider than the garment you’re going to alter (you will lose a bit of length in the seams). With a straight running stitch, sew all the pieces in the line. When you’re sewing the blocks, the right sides of the fabrics will be facing each other and you’ll be sewing looking at the wrong side of the fabric. When you finish that, they will all be attached but they won’t be very flat. Turn the strip over and iron from the back, pressing the seams apart. 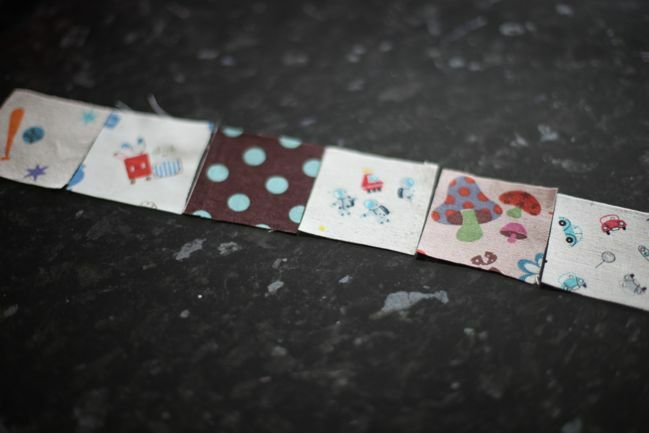 Presto – now the patchwork strip is flat! This step is optional – you can omit these stitches and the patchwork will still hold together, but I prefer the extra stitching on either side of the seam. It’s just a straight running stitch like everything else, about 1/8” either side of each seam. Double check that the length is still plenty to go across the garment. If not, add another square or two and repeat the steps for ironing and stitching. Then we can start to alter the original item. Triple check that you are looking at the front of the garment – it’s easy to get mixed up since it’s inside-out! When you’re sure you have the front, cut a straight line from the middle of your unpicked stitching on one side right across to the other side. Fold the fabric back to create the size of window you want for your patchwork strip. The window should be slightly smaller than your strip, since you’ll loose a little bit either side for the seam. 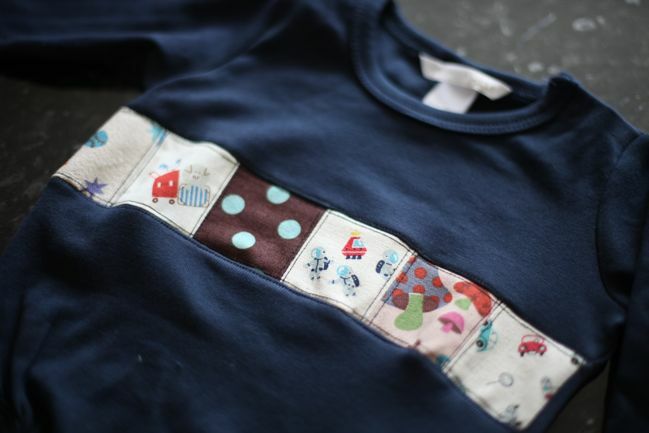 Press the folds flat with the iron – this will make it much easier to sew the patchwork in a straight line. 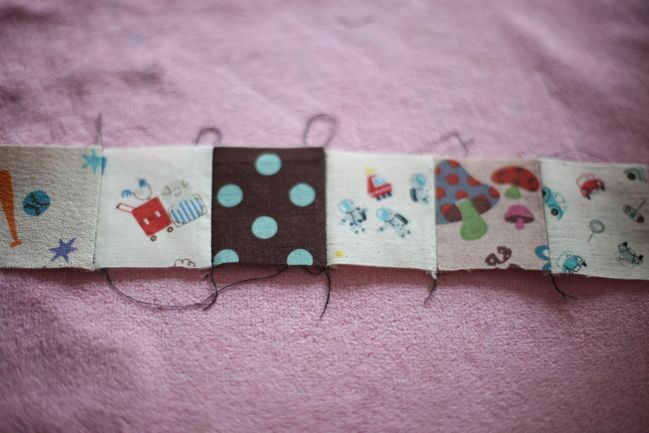 Line up the patchworked strip with the top fold, with the right sides facing each other. The edge of the patchworked strip will be in line with the crease you ironed. You can pin this if you like – I am a bit of a disaster with pins so I try to avoid them if possible! What is worth remembering is the knitted fabric will stretch and your patchwork strip won’t, so pull the knitted fabric a little bit when you sew – not lots, just a bit. Use that same plain running stitch along this whole seam. If you flip it right-side-out after you’ve sewn that seam, you can see it’s starting to look right! But go back to inside-out for now. 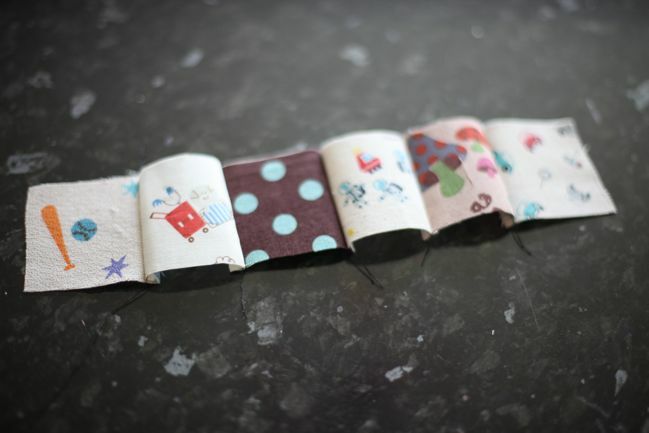 Line up the bottom crease with the bottom of the patchwork strip and sew again – right sides facing each other. Check that there are no gaps in the stitching and iron this flat. You can trim back bigger pieces of fabric and get rid of long threads at this point too. …we need to stitch those side seams back into place. Make sure to sew backward and forward at the end of each bit of stitching, since side seams need some strength. You can pull on the shirt to see if any holes appear. If they do, sew some more! And that’s that! Completely unnecessary in life? Yes. But also fun and super inexpensive and the whole project took under an hour. So I think that makes it okay! Especially as now I can make sure at least once in my nephew’s life, he can be clothed in both astronauts, VW Beetles and 1970s mushrooms. Yes indeed. So have you been doing anything crafty this Sunday? Do share!